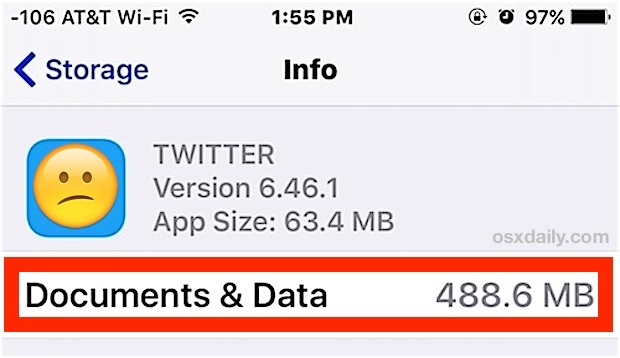 If you have noticed your iPhone is low on storage space, or perhaps you are just browsing your storage settings, you might discover that certain apps have a large “Documents & Data” storage footprint and inordinately large storage burden in iOS. We’ll cover what Documents & Data actually are, and also how to delete the Documents & Data found on an iPhone or iPad. 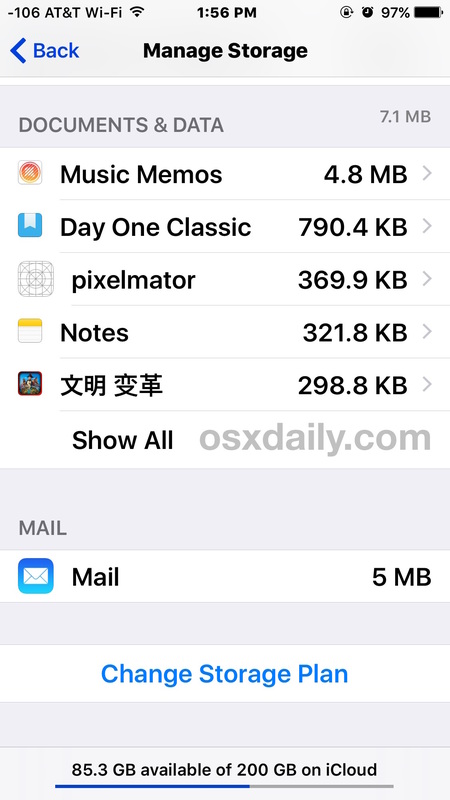 Note this is not really intended to be a guide to free up general space, and if you simply want quick ways to free up storage space in iOS go here instead. This is aimed specifically at conquering the mysterious “Documents & Data” that can be found relating to specific apps on iPhone and iPad. It’s a bit more advanced, and if you have never heard of Documents and Data, then you probably won’t need this article let alone find it useful. What are Documents & Data on iPhone and iPad? 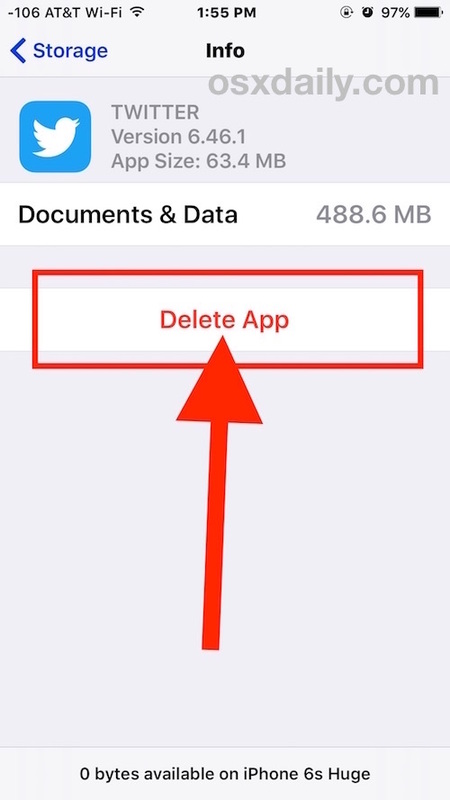 Keep in mind that when you delete an app, and then re-download it, you will likely lose whatever data, logins, and other saved details from that app. Do not do this if you don’t have login information saved elsewhere, and do not delete an app or its documents and data caches if you have important data stored within that app. You should back up your iOS device before beginning so that you can restore in the event you mess something up. Once you have re-downloaded the app, that apps Documents & Data burden should be just about nothing, though as you use the app it will slowly accumulate more documents, caches, and data again. In the case of an app like Twitter or Instagram, much of the documents and data are simply caches from pictures and videos, and thus are usually not really critical to the apps functionality in any way, they just take up space. Many other iOS apps behave the same way, which is fine until you start running out of storage space, and since iOS offers no way other to directly take care of this rather than deleting and redownloading the app, it can be annoying. If this sounds familiar, it’s probably because this is actually one of the main ways you can go about removing “Other” data storage from an iPhone or iPad (aside from restoring the device completely, which works best), and some users will go so far as delete all of their apps and then redownload them all again if many are found to be taking up large amounts of Documents & Data storage. The way Documents and Data is handled with iCloud Storage is certainly preferable to the impossible to manually delete caches that show up in native iOS apps, since it offers more user control over what to delete and what to keep. Hopefully this same ability will come to the app specific local device storage Documents & Data types found on iPhone and iPad. 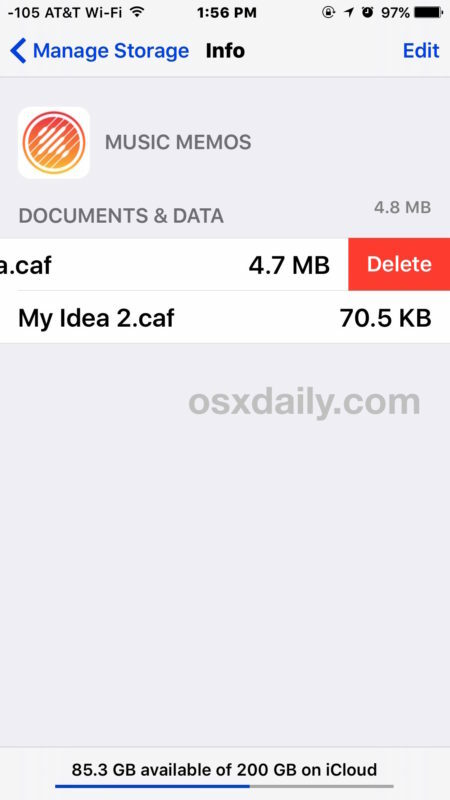 Why can users not manually delete Documents & Data from iOS apps? That’s a good question, hopefully a future version of iOS will offer a manual option to delete app caches and app data. Many Android apps have such a feature, and a manual cache removal option would be very welcome in the iOS world where Documents & Data and the “Other” storage routinely balloons out and is nearly impossible to reclaim without a significant amount of effort and often a device restore. Is there really no way to get iOS to delete local storage Documents & Data without removing the app first? Generally speaking, that is correct. However, you can use a few possible workarounds to force iOS to run it’s app “Cleaning…” process. One method that I have been using for years is to use a third party camera app to force iPhone Camera to take pictures even when there is no storage available, which tends to work for quite a while (where it finds storage space in who knows what ether is a big mystery) before you’ll get an error message about storage space which then triggers the “Cleaning” app name in iOS maintenance process. Very quirky, very much a workaround, and no, not at all user intuitive, and not really recommended. But anecdotally, it can work. Another trick that works in the same way is to attempt to download a huge movie from iTunes (for example, Lord of the Rings in HD) that clearly won’t fit onto the iPhone or iPad, which will also trigger the same app clean up process after or during the failure downloading the enormous movie. Know of another method to delete documents and data from an iPhone or iPad? Have some other insight to Documents & Data in iOS? Let us know in the comments! I like iPhone, I hate iPhone storage and data management. Every iPhone is always out of storage space. The iPhone has the worst storage management imaginable. It’s so bad that Google is now parodying it with commercials, and the Great Gruber is even agreeing with Google criticism. Just how bad is Apple storage management and data storage when even the Apple Apologist Jonny Gruber is critical? Every iPhone is out of space? Get one with more storage space. Try the 128G. Even a data hog like me has trouble filling it up. The trouble with a 64 GB or 128 GB iPhone is that backing it up requires a Mac with huge available disk space, while Apple sells Macs with 128GB and 256GB hard drives. I don’t have much stuff on my Mac beyond a couple of work apps but the 256 GB drive is nearly full, and it does not even have room for my iPhone to backup to. Backing up and downloading 64GB or 128GB to the iCloud is so slow and time consuming it is almost impossible to consider, I would need to leave my iPhone unattended at work for two days straight for it to complete the process. Apple needs to offer free iCloud storage equivalent to the iPhone size. Apple needs to offer iCloud Photo storage that actually works and is reliable. Apple needs to double or triple the size of all of its devices, 128GB and 256GB hard drives are not appropriate on $1500 and $2200 computers. Of course Apple is also selling three and four year old Macs as “new” and that is totally inappropriate as well. Sigh. I remember when I had a lot of good arguments to make in favor of Apple, but those are dwindling quickly. Apple is really nickeling and diming customers, and are increasingly hostile to customers and users. It is hard to remain faithful to the brand. It reminds me a lot of how Microsoft treated PC customers in the 90s with total arrogance and disregard, and look where Microsoft is today. I am concerned Apple will fall into the same fate, and the executives do not seem to care. Normally the apps are already on the computer, as is your music and home video libraries. The actual backup file of my 128GB iPhone (w/~90GB used) is only about 7GB. A better solution would be to keep your iTunes library folder on an external drive. Not a big problem since the speed of an SSD is wasted on media. Just don’t neglect backups. Documents and Data is a quick tip to get some space available on iOS device. I always use this trick to get some space available. It still makes no since that manually removing the cache was possible in betas of iOS 5 and then removed for literally no reason. That is interesting, I don’t recall the manual cache removal process existing in prior iOS versions but that makes it all the more mysterious that it is impossible in modern versions of iOS where the caches routinely take up huge amounts of data storage. 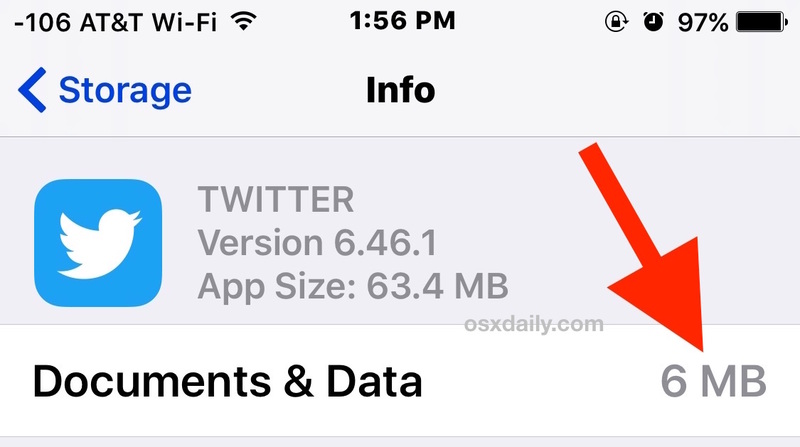 Spotify on my iPhone for example takes up about 1 GB of documents data cache, Twitter takes up 500 MB of documents cache, Instagram about 600 MB of data cache, Facebook has 300 MB of data cache, etc. Very bloated. iOS has a clear storage problem. I am starting to think Apple does not want to solve it, so that we have to buy bigger iPhones. For Apple to call it “Documents and Data” is a misnomer, it is cache. It is not documents at all. This is not on my iPhone, what gives? It would be nice if could do it, but when I follow your instructions, they are not there? I don’t have a settings icon on my iPhone. Everyone has Settings app on their iPhone, it is impossible not to have Settings. It is an iOS app. If you have iPhone, you have Settings. I could have sworn there used to be a delete data without deleting app setting. Am I misremembering? “Clear history and website data” is in Settings/Safari. Maybe you were thinking of that? Try using Macgo iPhone Cleaner. The first time I used it, it clean 3.4GB off and the system seemed faster and fewer pauses loading stuff. Now, I use it once a month and it clears 300-900MB each time. Have not encountered any ill effects from the usage of this program .. This might be my last Apple product; instead of getting simpler it’s getting worse. Wise up Apple! I doubt Apple will provide (or restore) a data/cache cleaning capability in iOS. It doesn’t fit into the “it just works” (even though it may not) or keep-the-user-insulated-from-file-system/no manual management approach they’ve taken. iOS devices are meant to be like appliances, where people shouldn’t have to think about such things. For apps that don’t have their own cache clearing ability (thanks to those devs for apps that do), I use the app deletion method…but only for those where recreating the settings each time would me more of a hassle than it’s worth. Ironically, the Apple Store app is one of the biggest culprits in cache bloat. Of course, taking and restoring a full iTunes backup works, but that’s tedious. But yeah, really the whole storage management thing on iOS is dysfunctional. Apple wants to make it pretty and right and a breath of air, but it’s simply inadequate. My proposal would be a “Files” app, which uses a VFS layer to provide file system management across file systems using “providers” that are installed by apps. Then you have a subdirectory for each app in the Documents area on the device itself, visible with Files, as well as directories for other types of media. Now in each app’s directory there’s a state directory, which may or may not be visible to the user, but in any case is included in backups. Caches are outside the document root, and all get spifflicated at once, whenever space is low or the user asks for it. I had used the technique of trying to rent a movie in the iTunes Store that was clearly too large to fit on my iPhone. I successfully reclaimed storage space. Then, a few months ago, I tried it again (Cleopatra HD) but I was charged for it, even though it did not fit on my iPhone. I disputed the charge and got a refund. Was this an isolated quirk or has Apple taken this work around away from us. It’s a shame they don’t offer an easy way for the user to clean caches, etc, to reclaim storage space. Incredible! I work with computers since 1981, the first IPM PC. I’ve got a dozens of PC, dozens of electronic LINUX based devices and all possible ANDROID based smartphones. Everything was managed more or less intuitively. And now I’we got iPHONE from my company. IT IS SIMPLY CRAZY. I have no words. It is impossible to remove waste data from the memory. I could not even imagine such TOTAL DOODOO. I recently had issues over the last several months where data was being slammed towards begining and ends of the month. I was alerted by carrier that data was at numbers well bellow my cap but claimed that it will add 1GB $15.00 If cap is exceeded! Of course they texted and said cap was exceeded and charge applied last several months. I was suspicious as to why they would bother informing me so early and never happened before! Is it a new policy to make up lost profit for the recent FTC fine? I have never come close to using my Data limit in the 2 years I had Iphone 6. These last 2 overcharges were months I was always home (recent disability) always using wifi. I always had Wifi assist set to off and background apps set to off. Additionally I manually selected cellular data for phone, safari, and maps. Everything else is selected to “off”! Cellular Data is always turned off while using wifi at home. I would like to think it’s just a bug issue in which Apple will remedy. However more likely, never ending issues that needs constant updates in which to never remedy. providing undisclosed info in these updates that work against device owner and ensure profitability by constant changes, not to mention job security! Which is a great thing, if done honorably! Wireless carrier said Data can not be controlled on iphone without using their “managed app” I asked why I paid Apple so much money for a device that couldn’t be controlled? Certainly considering my locked device was made specificIy for your wireless company, it should work and if not be instantly deemed defective with an immediate replacement and extra wireless charges dropped! I explained that all options I mentioned that were selected to off should prevent usage. In any event, I was unable to use Wireless carriers app anyway. I asked Wireless carrier to shut off data instead of charging me, when reaching limit. They responded, they couldn’t do that. Excuse was they had no way of knowing what data was used. I then asked why bother texting me with amounts used early and end of cycle with specified data usage and extra charges? If they had no way of knowing, the extra fees charged to me were an admission to fraudulent charges! They responded again with only the use of their app guaranteeing data usage control. I explained again that “manager app” would not work, of course no solution! The only option was to call and cancel data and call to reinstate data! What a deceptive and horrible business! Finally at the end of this long argumentive and nonsensical ordeal. Wireless carrier suggested ordering new device via insurance. I would say both parties point the finger at each other with me caught in the middle of no solution but to pay…pay…pay! However not sure of Apples guarantees of device working to stop all cellular data as advertised and a solution they, the designer can offer. In lieu of insurance replacement. If it is replaced via carrier insurance what gurantees this from not happening again with many customers? Solutions and reimbursements are certainly nice, but what of the many who are charged deceptively and pay continually from no fault of their own? It is defiantly deserving of investigation! I also noticed Documents& Data app (never used) and Icloud data use of a large amount, although Icloud was always selected to off! I’m curious if there’s a way to actually delete the instagram cache. Even deleting the app and downloading it again doesn’t do this. Search history is still there.